For many years asset management was considered to be a marginal activity, but today, it is central to the development of financial industry throughout the world. Asset management's transition from an "art and craft" to an industry has inevitably called integrated business models into question, favouring specialisation strategies based on cost optimisation and learning curve objectives. 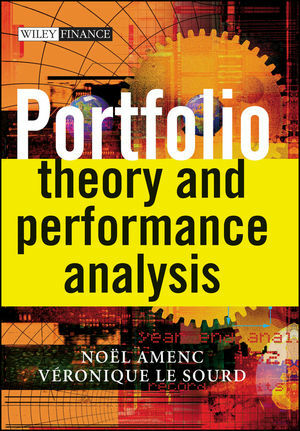 This book connects each of these major categories of techniques and practices to the unifying and seminal conceptual developments of modern portfolio theory. In these bear market times, performance evaluation of portfolio managers is of central focus. This book will be one of very few on the market and is by a respected member of the profession. Noel Amenc is professor of finance at the Edhec Business School, where he is in charge of the Risk and Asset Management research centre. Noel is also associate editor of the Journal of Alternative Investments. He is the author of numerous publications in the domain of portfolio management, notably in the areas of asset allocation and performance measurement. He also holds significant positions within the asset management industry, including head of research with Misys Asset Management Systems. Veronique Le Sourd holds an advanced graduate diploma in applied mathematics from the Université Pierre and Marie Curie (Paris VI) and has worked as a research assistant within the finance and economics departments of HEC Business School. She is currently a research engineer for Misys Asset Management Systems and associate researcher with the Edhec Risk and Asset Management Research Centre. 1. Presentation of the Portfolio Management Environment. 1.1 The different categories of assets. 1.2 Definition of portfolio management. 1.3 Organisation of portfolio management and description of the investment management process. 1.4 Performance analysis and market efficiency. 1.5 Performance analysis and the AIMR standards. 1.6 International investment: additional elements to be taken into account. 2. The Basic Performance Analysis Concepts. 3. The Basic Elements of Modern Portfolio Theory. 3.3 Efficient frontier calculation algorithm. 3.4 Simplified portfolio modelling methods. 4. The Capital Asset Pricing Model and its Application to Performance Measurement. 4.2 Applying the CAPM to performance measurement: single-index performance measurement indicators. 4.3 Evaluating the management strategy with the help of models derived from the CAPM: timing analysis. 4.4 Measuring the performance of internationally diversified portfolios: extensions to the CAPM. 4.5 The limitations of the CAPM. 5. Developments in the Field of Performance Measurement. 5.2 Performance measurement method using a conditional beta. 5.3 Performance analysis methods that are not dependent on the market model . 6. Multi-factor Models and their Application to Performance Measurement. 6.1 Presentation of the multi-factor models. 6.2 Choosing the factors and estimating the model parameters. 6.3 Extending the models to the international arena. 7. Evaluating the Investment Management Process and Decomposing Performance. 7.1 The steps in constructing a portfolio. 7.2 Performance decomposition and analysis. 8. Fixed Income Security Investment. 8.1 Modelling yield curves: the term structure of interest rates. 8.3 Performance analysis for fixed income security investment.